So Tuesday I made my way down to Alleycats Music & Art here in Orillia as I do most weeks to dig through the bins of vinyl and see what catches my eye, and see which one (or two) I might want to add to the collection. As I was unearthing a few pieces of choice vinyl here and there that I had not come across before (I like that) I then notice a milk crate on the floor filled with black gold, as I begin flipping through the crate the usual suspects start rearing their heads, you got your Boston's, your Kim Mitchells (did you ever go for that soda?) but then a few PRINCE records jump out and slap me right back into consciousness, they've got a copy of 'Around the World in a Day' right now that's in near mint shape (you better snap it up before I do). As I resumed digging I notice a copy of 'Arias & Symphonies' the second album from The Spoons, I was a little shocked to see it there (how could anyone part with this record? I thought) but then just behind it their 1983 album 'Talkback' makes its debut, again I'm stunned to see more Spoons…but then I notice it, the record I've been combing the bins year after year for; the soundtrack to the 1984 Ron Mann film 'Listen to the City'. Now I don't know if this is really that hard to find in the vinyl circles (for all I know someone might have 5 copies in their collection) but to me this was one of those records that has had a spot waiting for it these many years. Of course 'Listen to the City' came home with me, and after I had placed it on the old reliable Technics I got to finally hear it like it was meant to be heard. As I was relishing my latest (greatest?) find I started putting together in my head the post that would be wrapped around this record, I wanted it to be something a bit different, then it struck me; I'll interview Gordon Deppe (lead vocals and guitar) of The Spoons about 'Listen to the City'….So I did, read the complete interview below. SMM-Hi Gord, thanks' for agreeing to talk Sonic More Music about Listen to the City, the 1984 soundtrack to the film of the same name. How did this project get its start? GD: We were approached by Ron Mann to do the soundtrack for his new film. I'd always thought our music lent itself to cinema, especially the dramatic instrumentals like Trade Winds and Unexpected Guest At A Cancelled Party. He also approached Sandy about acting in the movie. We were between albums, so it was a good time for a different kind of project. SMM: How long did it take for you to complete it? GD: The new instrumental tracks for the soundtrack were written and recorded over a two month period, as I recall. Romantic Traffic and Tell No Lies had already been released on an extended play dance record. It was decided later to add them to the movie, since they hadn't appeared on a proper full length album yet. SMM: As far as direction went with Listen to the City, how much influence did Director Ron Mann have? Or did he just give you free rein? GD: Ron Mann gave me free reign. I would receive scenes every week and pretty well compose spontaneously to the footage. I decided to stay primarily with keyboards, not my first instrument, as well as a lot of ambient sounds. SMM: Were you working on Listen to the City during the recording of the Talkback album? GD: The TalkBack album had already been out some time when I commenced with writing the Listen to the City soundtrack. SMM: During the film Sandy is shown singing the track "Take Me Walking", was the music recorded before or after filming? GD: The song Sandy performs in the movie is "Sundown". It was written before the movie was filmed. SMM: Other than the two Nile Rogers produced tracks (Romantic Traffic and Tell No Lies) and Rob Preuss and Sandy Horne playing and singing on Sundown and Take Me Walking Listen to the City is pretty much regarded as a Gordon Deppe record, at the time of its release do you think it confused Spoons fans ? GD: I don't think Listen to the City confused many people. It was pretty clear that it was a soundtrack to a movie with a couple of Spoons singles in it. It also filled the gap between changing record companies and the release of the next proper Spoons album. That would be Bridges Over Borders. It would also be with two new band members on board. 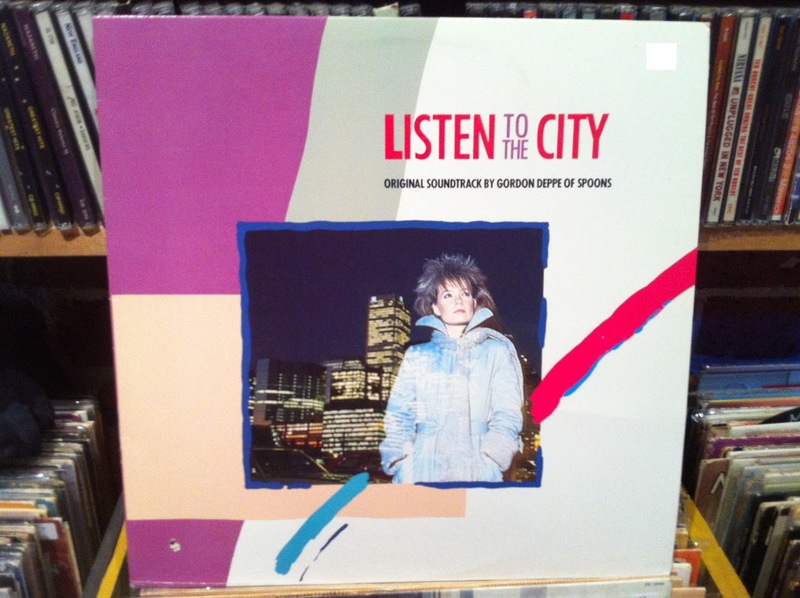 Just want to say a big thank you to Gord Deppe for taking the time to answer a few questions regarding 'Listen to the City', hope that gives a bit of insight into a record that in my opinion never got the recognition it deserved.